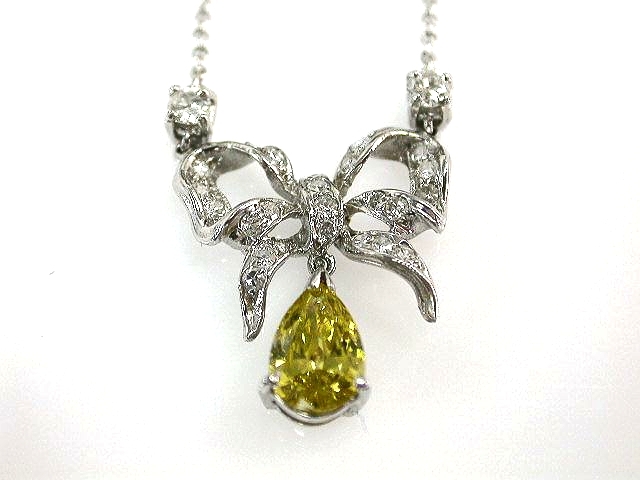 A stunning platinum bow motif pendant, featuring 1 claw-set irradiated pear brilliant cut fancy intense greenish yellow diamond, est. 0.72ct. (SI2 clarity); 2 claw-set round brilliant cut diamonds, est. 0.13ct. (G-H colour & SI-I1 clarity) and 24 bead-set single cut diamonds, est. 0.20ct (G-H colour & SI-I clarity). The 14kt white gold fine rollo chain is approx. 16.5 inches (41.91cm) long.